"When it comes to eighteenth-century fortifications in North America, writers often lean towards extreme hyperbole. Louisbourg, Fort Ticonderoga, Fort Niagara, and West Point have all been described as "the Key to a Continent." Suffice it to say that many strategists labeled their next target or theater of war as, "the key to the continent". Leaving aside these grandiose visions, I would like to compare the defensive records of two prominent fortifications during the 1754-1815 period. Fort Ticonderoga (originally French Ft. Carillon) and Fort Niagara. 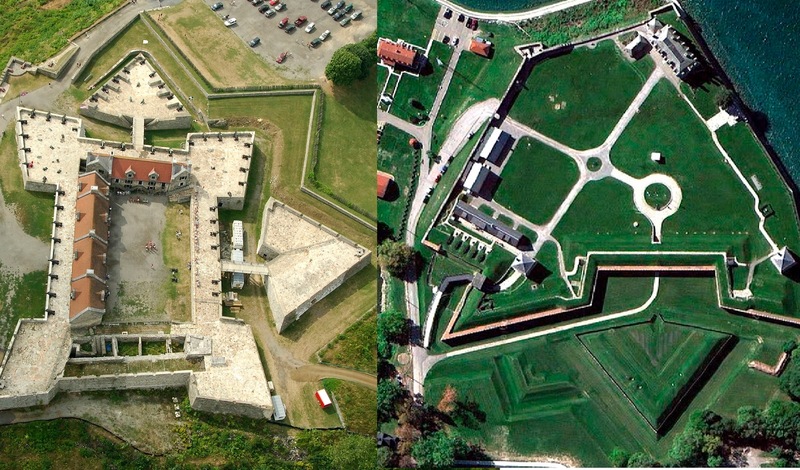 Both of these fortifications repeatedly changed hands in the course of this era, and were roughly handled by their occupiers and attackers. According to European conventions, fortifications were primarily in place to delay the enemy long enough for relief to arrive. For a massive citadel such as Lille in Europe, a siege of forty days might be normal. There were many instances where this system permitted the besieged to hold out against the besieger, such as the sieges of Prague and Olmütz in the European Seven Years War. I have addressed the topic of siege generally in this era in a different post, so let's focus in on Niagara and Ticonderoga. First, we will examine the fortifications themselves, before moving on their military record as defensive positions…"
Excellent article, Tango! My wife and I did our "fort" tour of both, with Toronto, Montreal and Quebec in between in the 1960's – before children. Niagara was fascinating as having been constructed by the French as a single building, permitted by the native Americans to see what "homes" were like in France. They regretted the decision when this big stone building with a 3-foot thick wall, and a center water well inside to allow lengthy defense, to say nothing of 6 pounder artillery in the gables of the roof! I enjoyed the development of Niagara over the years, with a hot-shot furnace installed in the 1800's to defend against the wooden warships of Canada. A great example of a "fortress" from the 1750's (?) unto the early 1800's. Ticonderoga is a wonderful structure, beautiful area. The only drawback in the 1960's was the stench from the Ticonderoga (wooden) Pencil company in town! I was there too!…. Good memories….. Excellent article. My family and I visited Ticonderoga in the summer of 2009 and Fort Niagara in the summer of 2017. We also went to the Niagara battlefields of 1814 and Fort Erie is highly recommended for a visit. Parks Canada has done an excellent job historically. Fort Erie is a gem. The Fort Niagara bookstore is also excellent and outstanding primary material on the War of 1812 is published by the Old Fort Niagara Association. Years ago I red a history of Ticonderoga (book) and the article gives a nice synopsis of the fort's history. I don't agree with the author's criteria for evaluating fortresses. It is the ability of the fortress to influence campaigns, both offensively and defensively, that matters most. During the F&IW Ticonderoga plays a much more important role than Niagara. In 1758 it turns back a British advance down the lakes. In 1759 it delays a a british advance. While Niagara serves an important purpose in securing the French communications with the Ohio country, those communications were endangered from the time the a British re-established their position in Oswego and destroyed Frontenac. Capturing Niagara just sealed the deal. During the AWI Ticonderoga played a more important role in the minds of commanders than during campaigns. In 1775 the key point in the Lake was St. John's. in 1776 it was the American fleet. In 1777 Ti was a road bump to the British and a target of opportunity for Brown's campaign. Niagara OTOH was one of the British bases of operation against the NY and PA frontier. In the War of 1812 Ti played no real role while Niagara was on the front line.